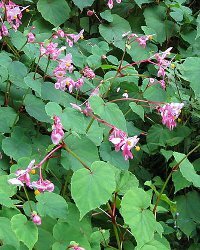 This bulbous begonia has ovate, olive-green leaves that are red beneath and bears pendent cymes of fragrant pinkish-white flowers in summer. Height 24 inches; spread 18 inches. For maximum freshness, please keep seed refrigerated in its original packaging until it is time to plant. Sow seed in spring in pots using soil-less seed compost such as peat. Do not cover. Water fom the bottom or with a fine spray and place under protection at 21 degrees Celsius. Germination usually takes 2 to 4 weeks. Transplant seedlings outdoors and grow on in fertile, well-drained humusy soil that is netural to slightly acidic in partial shade.